So sorry I haven't been a very good blogger, over the past 14 months. Got wrapped up in collecting and amassing CO vinyl, and have shirked the blog, in the process. My apologies. I can't guarantee I will be a regular poster, but darn it, I will try (grin). 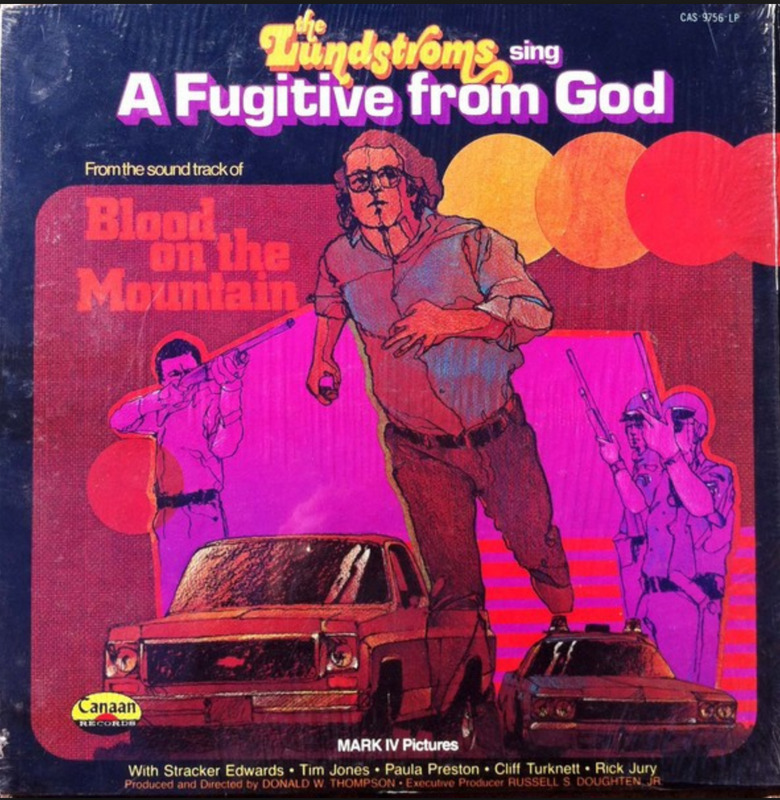 I figure since I have been MIA, as of late, now would be a good time to post this recent find (as in I just found today), the soundtrack to the 1974 Canon City-filmed movie, Blood on the Mountain, and its soundtrack, performed entirely by the Minnesota family gospel group, the Lundstroms. Fury explodes high above Royal Gorge in the spectacular Colorado mountains. A cop seeks revenge for his wife's death, on two fugitives who run for their lives. Oooohhhh, are you at the edge of your seat? Blood on the Mountain was based around Canon City and the Sangre de Cristo mountains. Shooting began in the late summer of 1973. The movie was originally titled “The Hawk,” and took about five weeks to complete. In addition to shooting in various locations around town, and employing locals as background extras, Blood on the Mountain would also call for Canon City’s police to help out with the film’s chase scenes. 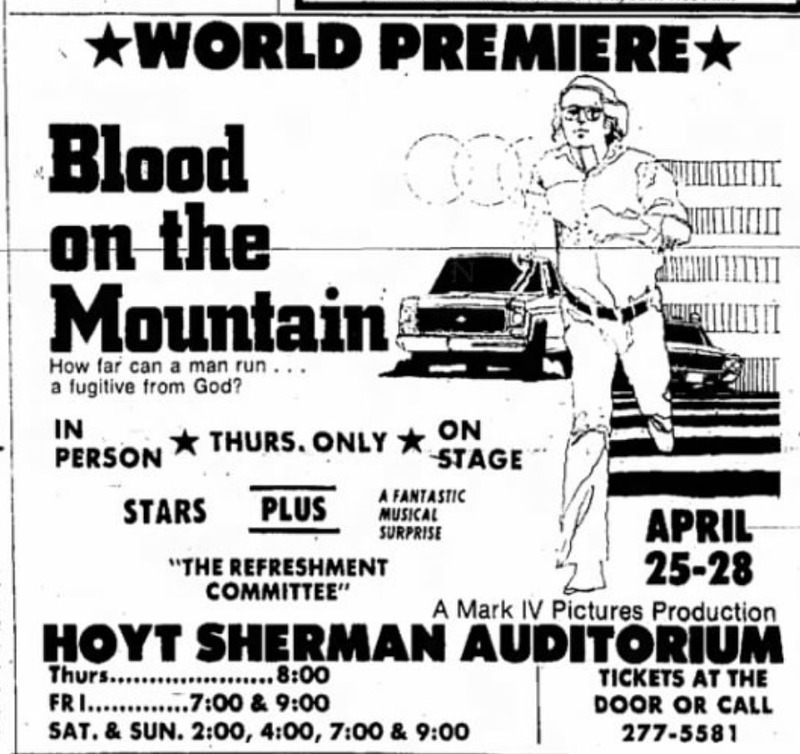 The production of Blood on the Mountain reportedly cost $110,000 to make. 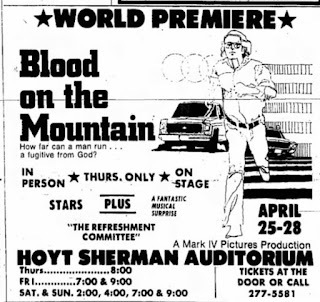 The film’s world premiere was held in Des Moines, Iowa (home of Mark IV productions), at the Hoyt Sherman Auditorium on April 25 1974. The LP appears on the prolific religious label, Canaan, out of Waco, TX (CAS-9756). The movie features actors Stracker Edwards, Tim Jones, Paula Preston, Cliff Turknett, and Rick Jury - yeah, the cast didn't ring a bell with me, but a quick search on IMDB revealed that Stracker apparently was a one-and-done actor, after this movie. Paula Preston had roles in three other movies, including the John Denver 1986 holiday flick, Christmas Gift. Tim Jones had a bit part in the Fresh Prince of Bel-Air. The star power came from Richard Jury, who appeared on I Love Lucy, My Three Sons, and Gunsmoke, and several other classic TV shows, as well as the movies Conagher, and One on One.